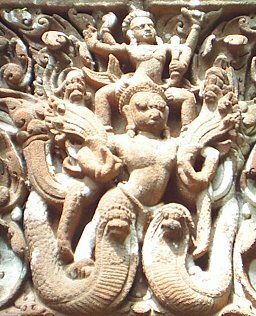 Garuda (from Wikipedia Images) [Placed into public domain]. This is a translation of an abridged version of the Garuda Purana. The Garuda Purana is one of the Vishnu Puranas. It is in the form of a dialog between Vishnu and Garuda, the King of Birds. The second section of this Purana (given here) deals with issues connected with death, particularly funeral rites and the metaphysics of reincarnation. Portions of the Garuda Purana are used by some Hindus as funeral liturgy. Indeed, some consider it unlucky to read this text except during funerals. Of interest are the intermediate states between birth and rebirth, which roughly correspond to the western concepts of Hell and Heaven. Since this was written during the medieval era, it is possible that the writer of this text had contact with Christianity. Earlier Hindu texts do not elaborate about 'hell' and 'heaven,' at least not to this extent, and the subject is completely absent in the oldest texts. Here, the torments of Hell are described in terms that would not be out of place in a Baptist revival tent (or Dante, for that matter). In addition, the four-square city of Yama, the God of Death, is reminiscent of the heavenly city in Revelation. However, these are way stations between incarnations (or, as termed in the Tibetan Book of the Dead, Bardos), not a permanent destination. The Garuda Purana starts with the details of the afterlife. Following this is an account of funeral procedures, including rituals, the astrological timing of the post-death observances, and ritual gifts. Balancing the extended vision of Hell in the earlier part of the document is a shorter account of the City of Yama. After that is an enumeration of correspondences between the macrocosmos and the human body. The final part of this text is an appeal to self-knowledge as the key to liberation, going beyond austerities and study of the texts. "The fool, not knowing that the truth is seated in himself, is bewildered by the Shastras,--a foolish goatherd, with the young goat under his arm, peers into the well."